At the end or beginning of each year, I’ll do the obligatory annual lookback or lookforward or both (spoiler alert: this is that) if appropriate. I’ll try to give you a snapshot of where I am, what I’m thinking about or working on on that date, tell you what I’m reading, post some links to art I’ve seen/written about recently, and catch you up on any news of importance about my art career. I’ll try to do a mid-year (Summer) check in as well that’s pretty similar, but no promises. Also, whenever I’m in a residency (which I am right now,) I’ll keep some kind of residency diary. In this case, I’m about to take over the residency’s Instagram account, so I’ll probably just feed that through here, but maybe there will be a little more than that. We’ll see. The beginning of 2019 finds me in Zürich, at Index's Freiraum, one of two (!!!) international residencies I’ve been awarded this year, studying one of the things the city is most known for: LUXURY. It will be awhile before there is a hard outcome from this work, but the project I’m developing is called “Pure Luxury”, and I’ll keep this blog populated with snippets of work in progress, as it progresses during this residency. I’m loving this city in Winter and the Index community is great—very supportive as I bumble through the trial and error of my process. Other (good) news is that I am here with the help of a grant from the Boston Cultural Council’s Opportunity Fund, and that when I return to Boston in March, I’ll be working with MASS MOCA’s Assets for Artists professional development team to build some (much needed) better business skills and resources for getting higher quality documentation of my projects: I’m (gratefully) one of their 2019 Matched Savings Program awardees. At this very moment I’m working (almost done!) on an inventory of my own personal luxuries, modeled on what I imagine the 4th step in 12-step programs is like: I’m taking an honest look at my varied indulgences, how I developed them, and why I “need” them. Then I’ll be making and circulating 3 surveys about luxury to Index’s network and other Zürich-ers (Zürich-ians?) and doing some audio recording in luxury boutiques/interviewing people. Oh, I’m also writing a letter to Oprah Winfrey. I’ll link to some of these things here when they’re ready/and or post them in the blog via Instagram. I’m also working on some grant applications so that I can afford to attend the next residency, but that’s boring. Thorstein Veblen’s Theory of the Leisure Class. The (as yet unpublished) dissertation of one of several amazing advisors to my luxury research, Nabanita Talukdar, “Tweets, Retweets and Luxury Connoisseurs: An Empirical Study of the Relationship Between Tweet Volume and Stock Prices for Luxury Brands." I spent the month of June at the Women's Studio Workshop in Rosendale NY, as their Public Artist-in-Residence, working on a project called Going. It was a first for me in a couple of ways: My first time living outside of a city for any significant length of time and my first time making a large scale, semi-permanent public art project. I've done large scale and temporary, and small scale and semi-permanent, but this combination was new for me. The scale, to be more precise, was 22 miles. The duration was to be 4-5 months. Going was billed as a 22-mile long meditation on the paths we make through nature and life, occurring along the Walkill Valley Rail Trail in the Hudson Valley in New York State. When I arrived at WSW, I wasn't positive that I would be able to work along the entire trail. It was important to me that I try, because I saw that most previous rail trail public art projects had occurred right around the WSW campus and I felt it was my duty as a public artist to try to connect with wider a public if possible. But I was without a car, and had to work part-time remotely while in residence, so I was very nervous about over-committing. After spending my first weekend riding the entire trail by bike I decided I would do it. I fell in love with all of the ways that the trail's environment shifted over its many miles, and loved the conversations I was having with people along the trail and when I got off the trail to explore each town it passed through. My strategy was to divide the month into thirds: The first 3rd would be research and writing. I would ride and hike the trail, pausing and writing site-specific texts for my project as different parts of the trail inspired me. The texts were to go on signs, meant to look as much like the existing signage as possible, so that people were unsure of whether their source was official or not. So this research period also involved reaching out to the two organizations that manage the trail, and to the sign maker who made the official signs so that I could mimic the fonts and colors correctly, as well pricing and testing fabrication materials and methods. The second 3rd of my residency was the fabrication. I still visited the trail most days, but for this phase I was mostly working incredibly hard in the studios. My goal was to put up 1-3 signs per trail mile, so with the help of custom jig designed by WSW's woodshop magician, Woody, I cut 40 1/2" luan boards into the dimensions and shapes of the official signs; gave each sign multiple coats of primer and paint; created 40 different silkscreens; printed a different text on each board; and then gave them each a few coats of shellac so that they would be both watersafe and look a bit aged. In the final 3rd of my residency, I would install the signs along the trail on steel poles matching the existing poles, and then document and celebrate the project. All of this happened, more or less on schedule, but there was a tremendous hitch. In the first day of installation, with sweaty, all-day, hands-on assistance from WSW's staff and interns, I hit both ends of the trail and planted 5 or 6 signs in between. I didn't want them clumped together or too near to any entrance to the trail that had parking because I wanted them to appear to have arrived mysteriously. It took a good contingent of human support to make this happen: Installing involved one person holding a 6-foot pole in place while another person pounded it a foot+ into the ground. The signs, poles, and 16-pound pole driver had to be hiked in on foot. On the second day of installation, we got 10 signs into the ground, plus great photographs of the work in progress. At the end of that day, one of WSW's staff mentioned to me that someone had complained about one of the signs in a community Facebook group. The sign (above) was on a part of the path that crossed through someone's (very beautiful) orchard and they felt it was a provocation for people to steal fruit from their trees. Or so I was told. I wasn't able to see the Facebook post. I thought this was strange, and asked to join the Facebook group in the hopes of communicating directly with the person who raised the concern. My hope was that I could figure out a way to make them happier with the sign where it was, or else to have them suggest a better place for it that posed less of a threat to the fruit. But I had to complete an application to join the group and by the time it was approved, I had been asked by one of the trail organizations to go and take the sign down. I did, and then put another 12 signs up, but at the end of that third day of installing, and two days before the opening, it was determined that the signs all had to come down. The permissions that I thought had been in place for the project were not in place properly, and though there was willingness to negotiate permissions for part of the trail, there just wasn't time for me to take all of the signs that were already up down and move them to new locations. Besides, many, like the one below, meant to occur near a bridge known to have a slight electrical charge, were too site-specific to move to elsewhere. Instead of living along the trail, which I'm told is used by 7-10,000 people annually, the signs (minus some that disappeared during their brief tenure on the trail) are now installed in front of WSW. I went with an esthetic that I think of as 'half-graveyard, half-front yard of someone with very strong religious convictions and a lot of signboard.' It's not at all the impact or intention I had proposed or aimed for, but it's what can be. My hope is that those signs, clumped together in that location, along with this blog post, for those who read it, can nurture some kind of conversation about who public art is for and/or what it needs to be like to meet the needs and desires of 'the public'. I was making something that I thought of as a gift for the trail-using public, but it was a gift that actually wasn't necessarily wanted, and so the big question then becomes, who is public art for if the public doesn't want it? It's like the life-lesson one gets from throwing a surprise party for someone that hates being surprised: I imagined myself enhancing the experience of being on the trail, but a) there was no one out there calling for enhancements to the trail experience, and b) the trail has aspects of its existence that have nothing to do with its use as a public resource. The trail crosses people's private land through a series of easement agreements, and it's completely valid to ask whether anything installed on the trail in these areas should be there if it interferes with someone's enjoyment of their private land beyond what has already been agreed to via the easement. If I had understood this before I started, I probably would have reached out individually to folks with easement agreements and tried to work out whether I was capable of making something that they would enjoy having in place. But it's too late for that now. I got a lot out of the residency despite not being able to realize the project I came to make: I worked harder than I've ever worked and learned a lot about my capacity; I got real intimate with some tools (most notably a middle-aged bandsaw and several well-loved scoop coaters,) that I barely knew beforehand; I actually liked the quality of my work on this project, which is rare; and most importantly, I built what can only be described as a visceral connection with the trail itself. The trail changed and sharpened my senses, and I miss it. I can see its mists in my mind's eye and feel its temperature changes with my mind's body and am left with an uncanny sense that it collaborated with me on my project. The idea of collaborating with a place is a fabulous one for me to walk away with. Even if this idea is pure fantasy and fades, at the very least, my time on/with the trail nurtured something previously unknown in me—a sort of primal, bodily logic that is new to me, but which feels installed permanently now in my consciousness. I'm breaking this blog post into two posts because I want to do two things with it. This post, the first of the pair, is my usual update on what's been happening—what I've been working on and thinking about. The second will focus on one particular project that I did in the month of June. I'm breaking that one out because I'll distribute it a bit farther afield that I usually distribute these posts (which is not at all! ), and so want to keep it focused for a specific audience that may not have interest in anything else I'm working on. I've been fairly busy since April, but not in the ways I'd planned. I did NOT end up doing the residency at Diablo Glass School. For two reasons: There have been some staffing changes there that impact their residency programming, so trying to plot the structure and timing of my work there with the residency's director was taking so long that it was cutting into the time I had set aside in order to do the residency itself. Also, the project I want to work towards there will require at least some funding to realize its final phase, so I decided I should postpone doing the residency until I can find a viable funding source. I'll check in on the situation at Diablo towards the end of the Summer. Maybe the residency can happen in late-Fall or next Spring and I can continue to seek funding for its culminating event. If that doesn't seem realistic, I'll look for another glasswork residency to propose the project to. Since April, I've made two public art projects, both in different forests, and one installation project that is decidedly city-sited. 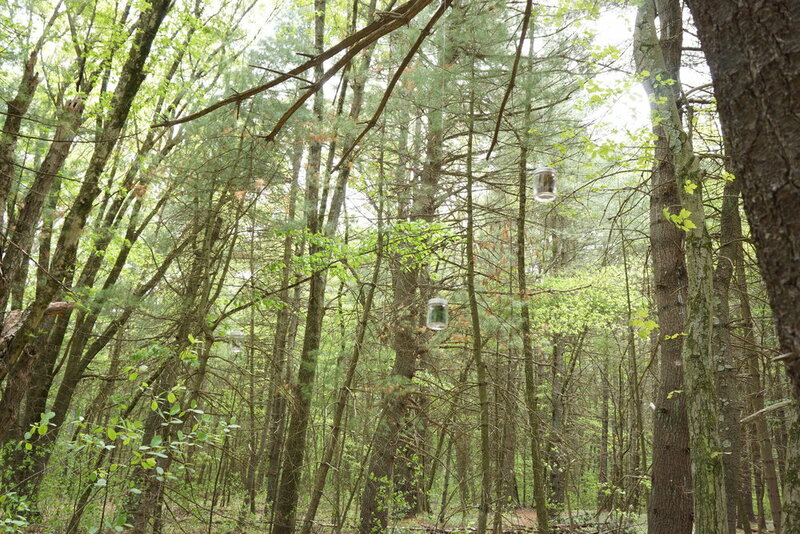 I redirected my remaining time allotted for the Diablo residency towards making a simple installation for an exhibition in the Hapgood Wright Town Forest in Concord, MA for a public art exhibition celebrating the 200th birthday of Henry David Thoreau. The project, called Forest for the Tree, is about the movement of consciousness or attention between the big picture and the more granular one. It brought specimens from the periphery of the larger forest to one, particular, old tree that lives fairly deep in its heart. It looked quite elegant when first installed (see photos here) in May, but I have to admit that when I went back to visit it for the opening event in mid-July, it no longer looked elegant. Some bits of it had been walked off with and/or altered by extreme weather. Much of what was still in place looked bedraggled or impacted by moisture to me. I do have extra materials for it that set aside for replacement and repair making, but it's difficult for me to get to the site and to get assistance and a ladder etc to make alterations. The small budget for the project has already been subsumed by gas, tolls, materials, etc. so I can't hire anyone to help. This means I've made a conscious choice not to nurture the piece, to let it deteriorate in place, and I feel conflicted about it. It brings up a lot of questions for me about why I sometimes work in ways that I know are beyond the limitations of my capacity and why I would choose to make a project at all (and put my name on it!) if I'm not fully invested in nurturing it. It's interesting to me as well that I'm filling this post with images of the piece, celebrating it in its prime rather than sharing documentation of its deteriorated state. We all do this—highlight the best of what we do or see ourselves to be, and this habit is a theme of one of the projects I've got kicking around in the world in proposal phase these days. To be fair to myself, when I went to the opening for this exhibition, I didn't bring a camera (or materials to repair the piece, which I might have if I'd known it needed it) because I didn't expect to have anything new to photograph. But maybe I will bring one when I de-install in October and capture the piece at its worst for this blog. Just as an exercise and to see what it feels like to showcase, unironically, the worst rather than the best. The city-sited project, on view in a gallery through the rest of this month is as far from forest-influenced as things can get. A collaboration with my friend Ernie Kim, All Right!, is a karaoke booth that only plays one song: Adriano Celentano's 1972 Italian pop hit, "Prisencolinensinainciusol." The song's lyrics are nonsense (except for the phrase 'all right') meant to sound like English to Italian speakers. In the karaoke booth, efforts to sing along are pretty futile, but funny. Because they are sung so fast, the nonsense words (which sound like Italian to me, btw) whip across the screen too fast to sing more than partially and the overall effect is that of not being able to keep up with the patter of a foreign language. It's an experience I'm pretty familiar with from traveling and from growing up in a neighborhood where my native language (English) was not really the primary language spoken. For me, All Right! was an opportunity to both demonstrate that feeling, and to take Celentano's cue to be playful and make fun of it a bit rather than allowing the frustration and the sensation of being excluded be so dominant in the experience that it inhibits trying to deepen connection across language barriers. It's basically a reminder that where language fails, play, humor and even comfort with bumbling can be a bridge. Comfort with bumbling is something I'm trying to nurture in myself right now as an artist trying to move my career to whatever the next level is. Ernie made the amazing signs that made the booth feel real. I did the installation and converted the music video into a karaoke video. All Right! was made especially for an exhibition, Tongue Tied, exploring language diversity and set in the most language-diverse part of the world, Queens NY. Detail of Mirror Man and Naked Man Play Rock Paper Scissors. I tell myself I'm writing this blog for you, but I'm realizing that I write this blog for myself. It's rarely actually about my work in progress in terms of technique or strategy, but about the ups and downs of living as a non-commercial artist. I'm writing about the navigation of the experiences involved in seeing my efforts as worthwhile: Not justifying them in terms of value to an art market or a community, but justifying them in terms of how much time and energy I put into developing the ideas and/or their realization and what I get out of that time. I also write about the evolution of my understanding of community is as it has developed and been defined through my relationships with those around me, working in similar ways. Each of my blog posts lately seems to have a similar formula: an update about what's going on; a critical assessment of the last thing I've worked on or what I'm working on in the moment; and then some reflection on my milieu. Since I'm very aware that I'm writing this for myself today, I'm feeling a little lazy about following the formula. I really just want to post pictures. But there's nothing that isn't implicated in the larger conversation I'm having with myself here. The photos came out of (or generated) a conversation that felt meaningful and like it might be a bridge to other things. The performance being documented, though it (like most of my recent projects,) did not meet many of the goals I had for it, accomplished things that I value just as much: a more detailed inspection than ever of my beliefs about how best to work with other people, and how teaching and learning work. And it forced me to think about masks and costumes and spectacles from a position directly opposite to the one I've been most rooted in for the last year or so. All these things feel useful to me. My old friends at The Residency for Artists on Hiatus (who are wonderfully supportive in an ongoing way) were thinking about this theme this month too. And where I landed (on the walk home from the conversation) was that the main difference between the part of the non-commercial art world that I live in and the more institutionalized art-community that stands between (and maybe buffers?) us from the true art market, is the difference between gate keepers and keepers. I'm realizing I live among the keepers of an amorphous, ever-changing tradition, and that the institutions that essentially act as gatekeepers to the commercial art world are also (perhaps inadvertently) acting as gatekeepers from the infectious influence of the commercial art world. And suddenly, for the first time ever, I find myself deeply grateful for the gates. What I'm doing next (starting pretty much this week, but the web copy is not quite in place anywhere yet,) is a residency at the Diablo Glass School. I'll be experimenting with flame and breaking glass and thinking about how vulnerable our bodies are and how fleeting life is. Plus hopefully getting my chain constantly yanked by the school's down to earth, scathingly sarcastic owner, because who the hell doesn't need to be knocked off their high horse a few times a week? Some of the pieces I make never make it onto "pages" on this website, and often don't get really documented either, so I try to write about them in here. I've got a piece (Hermeneutic Cycle: Three Phases) in a show that closes this upcoming weekend that falls into this category. It's small, simple, emotional, and involved some soul searching. I think it was also a failure in many ways. It's just a collection of stuff, with a narrative (that only a jury saw) to tie it together. It also had a series of actions, but none of them happened the way that they were supposed to. Which is okay. "This experience is a good reminder that honoring intention sometimes has to trump aesthetic desire in a conceptual work." That said, the psychic—or psychological—stuff of this piece that I was going for never really emerged completely either, so I'm not even sure it worked on the deepest conceptual levels, despite my best efforts to create and follow formulas that I hoped would force these dimensions to the surface. And it was a bit anti-climatic on the pragmatic level as well, in that it would have or should have culminated in some explanation on a panel discussion, but the panel got reconfigured so it won't be covered now. In any case, up next: another small, simple piece. Hopefully not too simple, and ideally a little more successful, but who knows what will happen. Maybe it's a symptom of this new era that everything creative feels just slightly flat. We'll see. But I'll make time to write about that project soon after it happens (mid-March) rather than waiting another month or two to write here. Other than that, I've made a lot of proposals that aren't being realized, and am gearing up to begin my first 2017 residency in about a month, which I will also talk more about next time. Dream Jar, created by Moira Williams and photographed by Christina Freeman. I guess I should start by picking up where I left off last. My work in progress at the time culminated in a simple installation called 96 Franklin in a group show that closed at the beginning of December. It was primarily an audio piece, with a huge pile of sawdust and a (rather wonky) overhead projection. I don't think it was formally documented (the perpetual problem...) but I'll post a cellphone shot of a detail I captured while installing below. I ended up doing less reflecting than I expected on the "Roaming Assembly" art project/artist retreat (led by the indefatigable Moira Williams, co-founder of Walk Exchange) that I was heading out for when I wrote last. But it was a unique and wonderful way to connect with a group of strangers-now-friends and the incredible beauty/arts community in the Hudson Valley. Right now, I'm doing not much. I haven't completed anything since 96 Franklin, but have begun work on a small video piece that I want to (hopefully) show at AMP next Summer. I've also been putting a lot of my free-time into volunteering for two local arts organizations. As the year winds down, I'm feeling especially grateful for my arts communities and creative networks, near and far. I have strong concerns that the new political administration taking control of the US in 2017 will change this landscape in ways that I can't predict yet, so I'm in part just savoring this moment where everything still looks familiar. In fact, everything that I currently have locked down for 2017 (two context-specific works slated for group shows in January and March; two invitations to residencies) is rooted in the work of these kinds of communities. So I'll know in real time I guess what this horizon will morph into. Detail (of installation in progress) of 96 Franklin. Worked until 2 last night then was up at 6 this morning to get the right light to begin thinking about "placemaking" in a place that I love that is in danger of disappearing (because of placemaking.) Ironically, it's a place for making, and even more ironically, the piece I'm working on will be shown in a gallery that is part of the very placemaking that is doing the displacement. It's dizzying. I'm making breakfast for houseguests as I type this, so won't talk in any depth about what I'm working on, developing, my process... I will only say that I have been facing new and interesting challenges as an artist lately and that I am trying to rise to these challenges with grace and a little less sleep deprivation, but not quite succeeding at the latter at the moment. That, and maybe that I'm finding myself vacillating at a much more rapid rate between performance/engagement based practices and whatever the hell I should be calling the more instal-ly/environmental kind of stuff I do. Ephemera from What?! ?, performed at Panoply Lab on 10/13/16. I'm thinking a lot about time and pace: trying to (and failing so far) to believe that I can move—am allowed to move—at my own pace and that there is enough time for "everything" to happen. But I'm about to go on a "Roaming Assembly" of women artists, walking, contemplating and camping for four days in the Hudson valley. So I'm sure I'll find my "center" by the next post!